If you like APRS and cheap Chinese radios you might be interested in this Spanish balloon project which will launch tomorrow (Sunday) from Madrid. The helium balloon will carry aloft two Baofeng UV-3R transceivers connected as a transponder with a 435.450MHz downlink and a 145.840MHz uplink, an APRS module on 144.800MHz beaconing the SSID EA1RCS-11, three cameras, a radio ionosonde and a parachute. 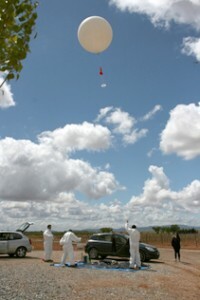 The team anticipates that the balloon could go as high as 30km, making operation or reception possible over a large area of Spain and neighbouring countries. For more information see the project website http://cienciactiva.com/. Just a few days after I wrote that the AlexLoop WalkHam is a great companion for the Elecraft KX3 and here is a video by Steve WG0AT showing the combo in action. 5 and 9 using QRP SSB! I can't wait until I'm fit enough to take the KX3 and loop to the outdoors myself. Following a tip on the Elecraft reflector from Wayne N6KR I ordered a Think Tank Strobe Stuff Belt Pouch to use as a case for the KX3. As Wayne suggested, this could be the ultimate compact KX3 carrying case. The ultimate KX3 carrying case? 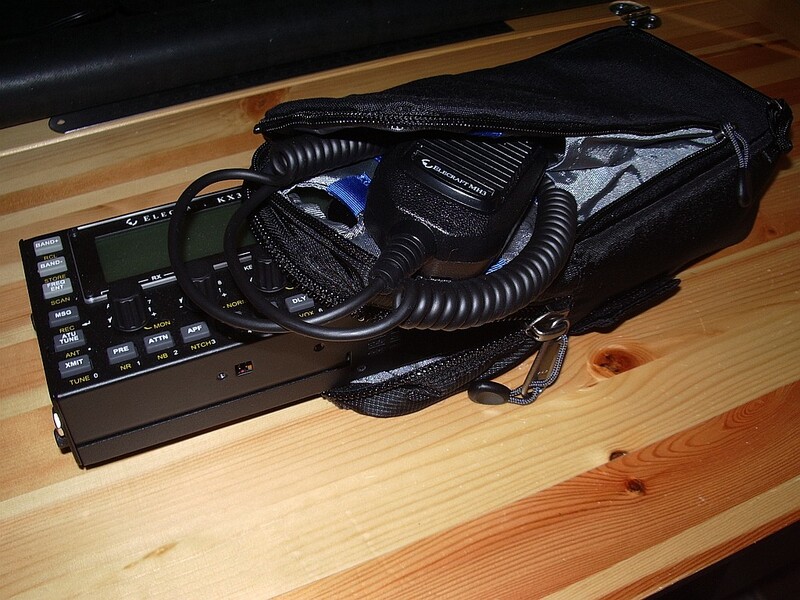 Wayne managed to squeeze the KX3, the MH3 mic, a backup mini-mic, the KXPD3 paddle, ear buds, a spare set of 8 AA cells or a 4-cell, 14-V Li-Ion pack, two 25ft. lengths of Wireman #26 "silky" for antenna and ground wire, two 1in. stainless-steel hex nuts (for tossing wire into a tree) a 20-m two-piece telescoping whip (in case there isn't a tree) a BNC elbow and a BNC-to-binding post adapter (to attach the two wires) into the case. I'm not quite sure how he managed it, but there's no doubt that with a bit of practice you could get a fully functional portable station in there. CW diehards could dispense with the MH3 mic which takes up the most space next to the KX3 itself. If you use the AlexLoop WalkHam then you could omit the wire and a few other bits and pieces. 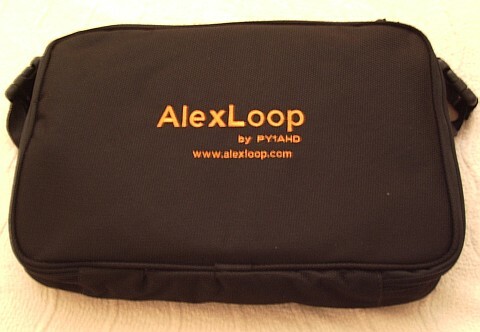 The belt pouch looks smart alongside the AlexLoop carrying case. Search for the Think Tank Strobe Stuff Belt Pouch by name and Google will find you the best local supplier. Whenever I have taken a rig to operate in the Great Outdoors using a wire antenna I have often been disappointed. This is probably due to my use of inadequate antennas - Miracle Whips and the like. When I have tried wire I usually fail to get it up high enough. Usually when hurling a rock attached to a string into the trees, the rock rebounds off a branch and narrowly avoids hitting me on the head. If I do manage to get it up high the rock irremovably entwines itself with a branch just out of reach. There has to be a better way! I have long been an enthusiast for magnetic loop antennas and have often wished I could use one as a portable antenna. 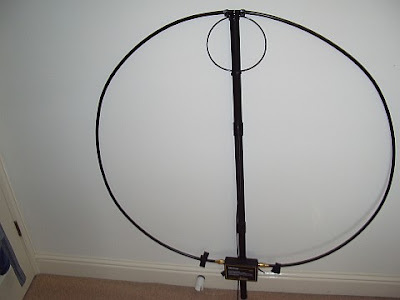 My Wonder Loop was an attempt to make such an antenna, but it was less portable than transportable (by car) and has seen more use as a spare antenna from inside the shack. I looked longingly at the WalkHam made by Alex PY1AHD and wished I could make a portable loop as neat and compact as that. If I had to make it myself it might never get done so I decided to bite the bullet and buy one of Alex's ready-made loops. There are two versions of the AlexLoop. One is a kit using copper tube for the radiating element and costs $199 US. 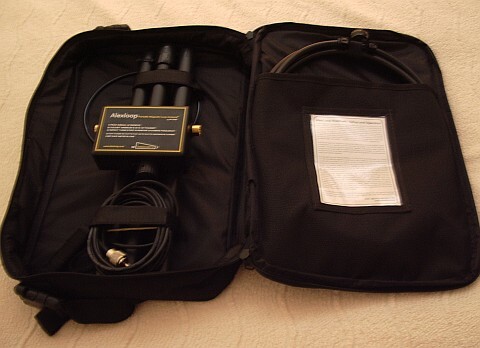 The other version, called the WalkHam, uses stout coaxial cable for the main loop and comes ready built in its own custom made carrying case similar to a laptop case. The price of the AlexLoop WalkHam is $299 US. Shipping to the UK by express courier to the UK is a further $82 US. The total cost to me using PayPal was just over £250 at the present exchange rate. The WalkHam is well made with gold plated connectors for the loop element. It is easy to assemble, though not so easy to pack away unless you have a photo to show how the parts go back! The mast is made of black plastic tubing and is in three push-together sections. Once assembled the antenna may be used whilst held aloft - hence the name. Most users will probably prefer some sort of mast. The AlexLoop WalkHam ready for use. The loop is 1 metre in diameter and tuned using an air spaced variable capacitor with a 3:1 reduction drive giving a 4 : 1 tuning range: 10m - 40m. Most magnetic loops including home-made ones only manage a tuning range of 3:1: 10m - 30m or 15m - 40m. My MFJ magnetic loop is the 40m - 15m version as it was bought during the last solar minimum when 12m and 10m were not much use! 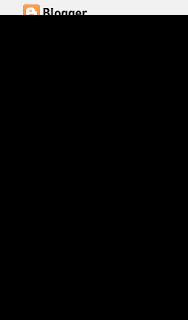 The coupling loop has a diameter of about 20cm. The maximum power handling is 20 watts PEP, 10 watts continuous wave, making the WalkHam perfect for use with QRP radios like the FT-817 or Elecraft's new KX3! Tuning as expected of a magnetic loop is extremely sharp but I noticed little or no hand-capacitance effect. With a little practice the loop can be tuned by peaking for maximum noise in the receiver. If the SWR isn't low enough then the tuning may be touched up using transmit and the rig's built-in SWR meter if it has one (both the FT-817 and KX3 do!) If not, a simple SWR indicator as I used in my Wonder Loop would be a big help. Subjectively the AlexLoop seems to work as well as my MFJ magnetic loop in the attic, which itself is comparable to a full-size dipole. There are not many portable antennas that would beat the AlexLoop WalkHam for performance, unless you are able to erect a couple of 40-foot masts! One thing that would improve the package would be a way of erecting the antenna so that it will stand on its own. I think my arm would soon get tired holding the WalkHam aloft! Possibly a short guyed mast made of sections of electrical conduit would do the job: magnetic loops don't need to be far above ground in order to work. Some users are reportedly using photographic tripods so I'll probably investigate that in due course. On 10th June DX Sherlock showed that a big Sporadic E opening was in progress. The red lines showing contact paths stopped tantalizingly short of north-west Cumbria, unfortunately. I listened on 10m but I didn't hear the S9+ signals such an opening would suggest so I thought I would do some WSPR on 10m, moving to 6m if the 10m signals suggested the skip would be short enough. They eventually did, as DX Sherlock indicated the lift was getting stronger. I moved to 6m, running 5W to the attic multi-band dipole, and eventually spotted or was spotted by stations as far afield as Austria, Spain and Morocco. During the peak of the opening I broke off from WSPR to tune the bands and make a few contacts. 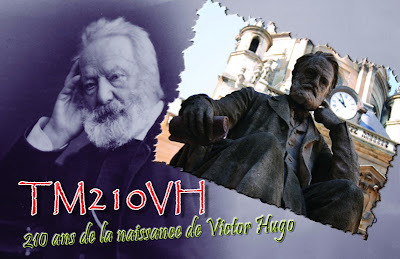 On 10m I worked TM210VH - a special call commemorating 210 years since the birth of Victor Hugo. 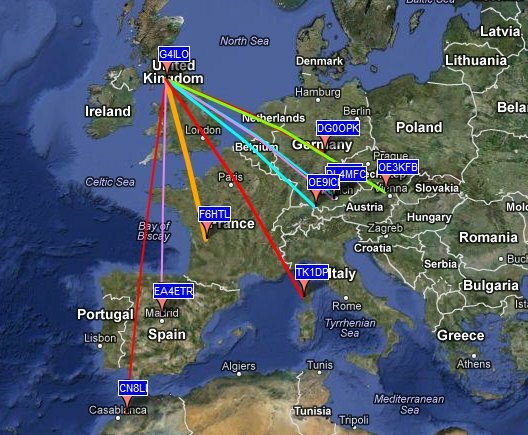 I made contacts into Italy, Switzerland and France on 6m as well. Seeing some massively strong signals now on 10m WSPR so time to check out 6m I think! I was doing some web surfing in Firefox (Windows) when I had a bit of finger trouble. In response, Firefox popped up a message that said something like "you have chosen to open 27 pages at once, do you really want to do this, continue or quit." I responded "quit", Firefox didn't open any pages and I carried on with what I was doing. However, the next time I opened a new tab it opened, not with a blank tab but one containing large thumbnail images of pages I had recently (or not so recently) visited. I assumed that my bit of finger trouble had accidentally done something to Firefox. But how to undo it? I racked my brains for a solution until I remembered that I had got Magicure on my system. Magicure is a bit like System Restore but it works for all types of file not just system files. It has got me out of many a scrape in the years since I installed it. 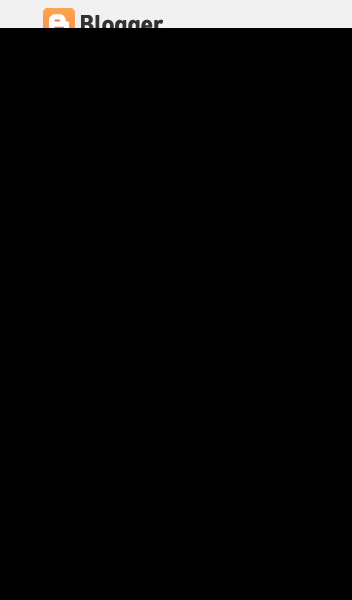 So I used Magicure to roll the system back to its state yersterday morning and Firefox appeared to be back to normal. 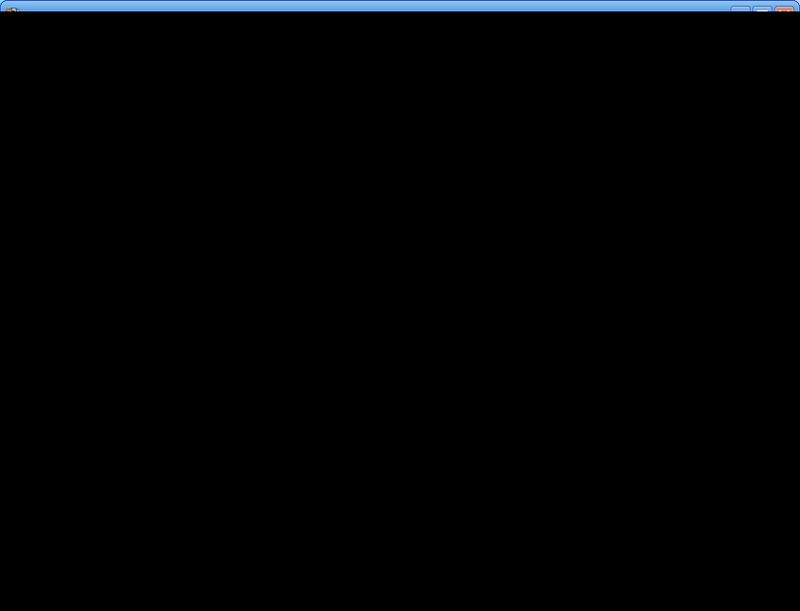 I started the browser, opened a new tab and it came up blank as I wanted. Everything seemed fine until late this morning, when I opened a new tab in Firefox and it was full of recently visited pages again. This was not how it was yesterday morning. Magicure has never yet failed to restore my computer to its exact state on the date I roll back to. So what the heck is up with Firefox or my computer and how do I get it back to normal? For the last few months I have been getting more and more irritated by the captcha word verification required to comment on certain blogs. The captchas Blogger used to use were perfectly adequate, in my opinion. But Blogger insists on "improving" its user interface. If it ain't broke, don't fix it I say. The latest two-part captchas Blogger uses seem designed to keep out the good guys and allow in the bad. The statement "Please prove you're not a robot" seems ironic, as only a robot could decipher the letters. This morning, on a blog I won't mention, I had to refresh the captcha three times before getting one that contained only recognizable letters. Of course if Blogger's captchas were annoying me they were also annoying you, my readers. So I decided to disable word verification on both G4ILO's Blog and One Foot in the Grave. At the same time, I have enabled moderation for comments to posts more than 2 days old. Most of the valid comments are made within that time period anyway. If a comment is made later than that then a further small delay until I approve it will hardly be noticed. Hopefully this will result in an increase in valid comments and fewer spammy ones. But if I find too many spammers are taking advantage of the two day window of opportunity I'll turn moderation on for all comments. If any internet lowlifes are reading this, don't even think about it. For the benefit of anyone who arrives here looking for a way to turn off word verification, here's how. First, make sure you are using the old Blogger interface (I'd switched back to it already as I could never find anything in the new one.) Then, under Manage Blogs, click on Settings for your blog. Then click on Comments in the row of tabs along the top. The settings you need are on that page. 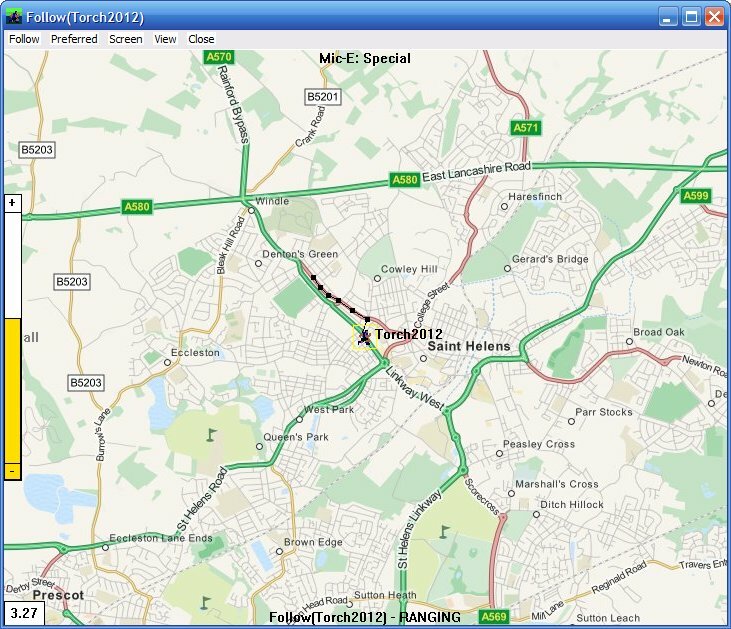 You can follow the progress of the Olympic torch using APRS. The name of the torch is TORCH2012. The screenshot below shows it being tracked by APRSIS32. 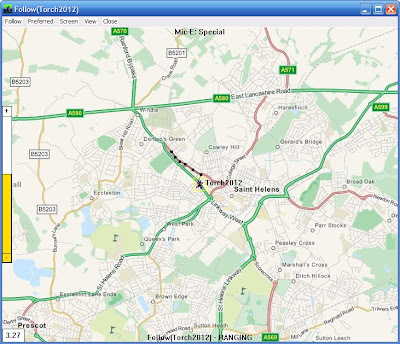 If you don't have an APRS client you can follow the torch at aprs.fi by going to http://aprs.fi/?call=TORCH2012.